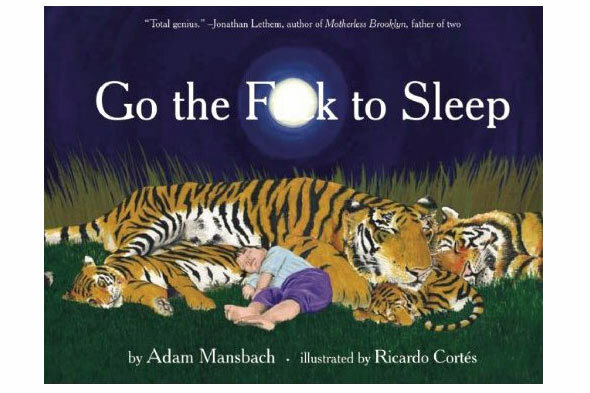 When "nighty-night" or "hush, little baby" just aren't helping to lull your screaming baby to sleep, you may be tempted to take some cues from a new bedtime story: "Go the F@#k to Sleep." It's a thought that has probably crossed the minds of many an exhausted parent at 3 a.m., when the wee one refuses shut eye. Now, novelist Adam Mansbach has put the idea to pen in his children's book "Go the F.... to Sleep," which is not due out until next October, and is actually not for kids, he tells "Today." "The cats nestle close to their kittens. Please go the f@#k to sleep." "Hopefully, the book is very reflective of what we all feel putting our kids to bed," Mansbach tells the news show. "We all love our kids -- it's not like we stop loving our kids -- but as the minutes tick by, we'll do anything to get out of that room." A visiting professor of fiction at Rutgers University, Mansbach is dad to a 2-year-old daughter, Vivien. He says he hopes the book will be a fun moment of relief for sleep-deprived parents, telling "Today" that despite the "tremendous culture of parenting," there's a lot that doesn't get talked about.